In this article, we summarize the investment case for antimicrobial resistance (AMR) action; discuss policy options for low- and middle-income countries; and describe what the World Bank Group is doing to fight AMR. Annual global gross domestic product may drop by up to 3.8% by 2050, if AMR remains unchecked. To avoid this outcome, the world must invest US$ 9 billion annually. 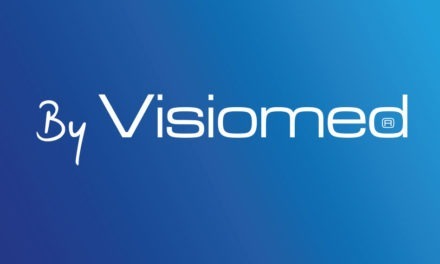 Cumulative benefits from this investment through 2050 may range between US$ 9.8 trillion and US$ 26.8 trillion, in net present value terms. Returns on AMR investments are likely to be exceptional: up to 88% annually, if 75% of AMR costs can be avoided. Promising AMR strategies for countries include harnessing universal health coverage (UHC) reforms to accelerate AMR gains and reducing antibiotic use in livestock. The World Bank Group will support country and global action on AMR, for, example, by developing a global investment framework to optimize AMR finance. he dwindling efficacy of antibiotics and other antimicrobials worldwide can be seen as a “tragedy of the commons” (1). The global community is squandering a precious, shared resource, as each actor pursues short-term self-interest: a pattern comparable, for example, to the collapse of fisheries due to overfishing. The gravity of the AMR threat has an unexpected consequence, however. It means that investing in AMR containment has become one of the highest-yield development investments available to countries today. In this article, we summarize the investment case for aggressive AMR action; discuss policy options for low- and middle-income countries; and describe what the World Bank Group will do to support AMR containment in countries and globally. Our discussion is based on a recent World Bank Group report (2). The World Bank Group has used economic simulation tools to quantify the losses that AMR may inflict on the global economy between 2017 and 2050. AMR impacts were modelled as shocks to labour supply and livestock productivity – a conservative approach that underestimates AMR’s full economic effects. In the optimistic case of low AMR impacts, our simulations found that, by 2050, annual global gross domestic product (GDP) would likely fall by 1.1%, relative to a base-case scenario with no AMR effects; the GDP shortfall would exceed US$ 1 trillion annually after 2030. In the high AMR-impact scenario, the world will lose 3.8% of its annual GDP by 2050, with an annual shortfall of US$ 3.4 trillion by 2030 (Figure 1). During much of the period through 2050, the annual reduction in global GDP caused by AMR could be as large as the losses provoked by the 2008–2009 global financial crisis, at its most severe (Figure 2). 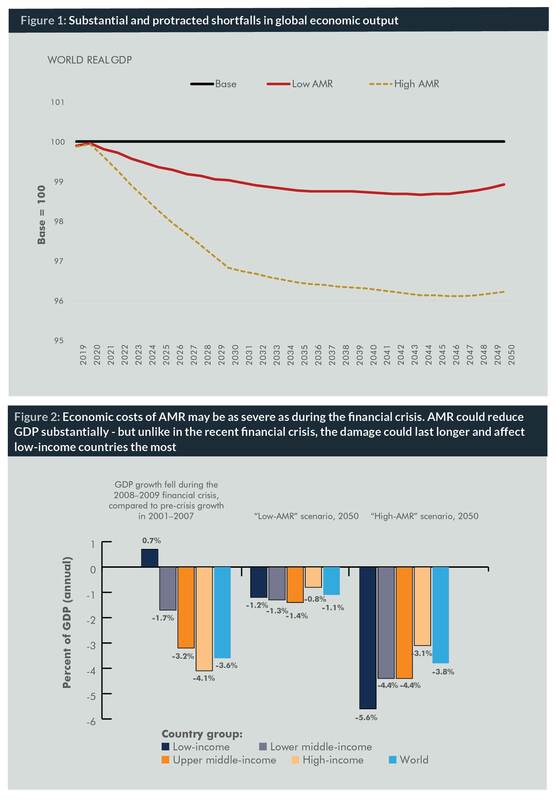 However, the cost impacts of AMR on GDP would be worse than those of the financial crisis in two respects. First, they would be felt continuously for decades, not just for a couple of very bad years, as was the case in the acute phase of the recent financial crisis. Moreover, with AMR, low-income countries would experience larger drops in economic growth than wealthy countries, so economic inequality between countries would increase. Without AMR containment, the key Sustainable Development Goals (SDGs) for 2030 – reducing global inequality, ending poverty, ending hunger, ensuring healthy lives, and revitalizing global development partnerships – are less likely to be achieved. Policy-makers may be concerned that the expense of tackling AMR will prove overwhelming. On the contrary, our analysis shows that action on AMR constitutes one of the highest-yield development investments available to countries today. The costs for comprehensive global AMR-containment measures are estimated at US$ 9 billion annually in low- and middle-income countries. About half of this amount is for investments in, and operation of, core veterinary and human public health systems in 139 countries. The recommended investments in AMR containment are justified according to two key economic criteria. First, the test of net present value (NPV) is unambiguously satisfied. 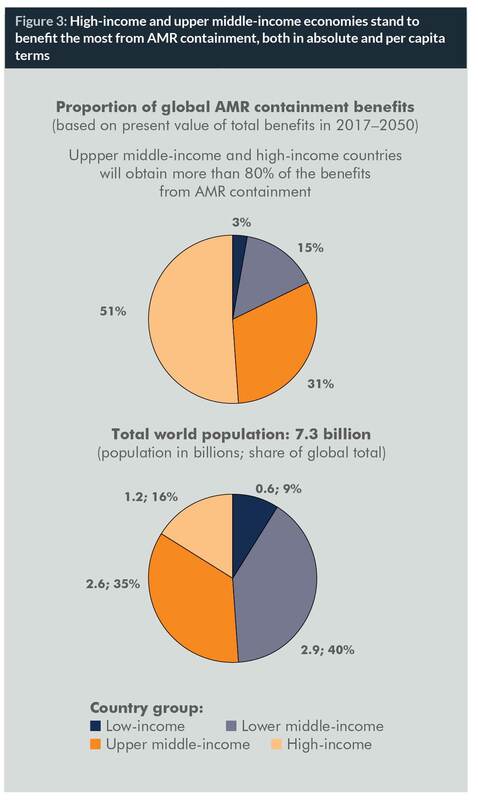 Assuming that just 50% of AMR costs will be avoided by vigorous AMR containment efforts, the expected cumulative global benefits from AMR containment in 2017–2050 range between US$ 10 trillion and US$ 27 trillion, far greater than the investment costs of US$ 0.2 trillion. The net present value is thus between US$ 9.8 trillion and US$ 26.8 trillion. Different countries stand to benefit from AMR control in different ways. Low-income countries will see substantial economic pay-offs, relative to the size of their economies. The largest absolute and per capita gains, however, will actually flow to upper middle-income and high-income countries. Assuming, very conservatively, that only 10% of the modelled AMR costs were averted through containment measures, high-income countries would still obtain benefits of US$ 0.9 trillion and US$ 2.7 trillion, in the low AMR-impact and high AMR-impact cases, respectively. This is four times and 13 times more than the global investment cost of US$ 0.2 trillion (Figure 3). The second test of the investment case for AMR control considers the expected economic rate of return (ERR) on the US$ 9 billion annual investment. Assuming that investments would be made for seven years before any benefits materialize, the ERR ranges from 31% annually (if only 10% of AMR costs can be mitigated) up to 88% annually (if 75% of AMR costs are avoided). The chance to obtain returns of this magnitude constitutes an exceptional investment opportunity for countries. We have argued that aggressive action to tackle AMR is needed now. But what exactly must be done? Let us first state a general principle. AMR cannot be managed in isolation. Drug-resistant infectious diseases are a subset of the broader range of microbial threats to human and animal health and welfare. From a public health and policy-making standpoint, drug-resistant infections have practical similarities to all infectious diseases with pandemic potential, for example, Ebola and Zika. Instead of viewing AMR as a separate issue isolated from other health challenges, it will be more effective and less costly over time to build a common core of permanent capabilities in all countries for managing the full range of infectious threats. As AMR control is part of a wider agenda of infectious disease management, so the response to infectious diseases in turn depends on the robustness of countries’ broader health systems. Effective AMR action depends, for example, on reliable health information systems, rational procurement and management of drugs, and the presence of a trained and motivated health workforce. Building core human and veterinary public health and infectious disease management capacities in all countries is the critical step in confronting the AMR threat. The World Health Organization’s (WHO) Global Action Plan and other recent reports present a comprehensive high-level agenda for tackling AMR (3, 4, 5, 6). Our policy recommendations concentrate on select areas where opportunities for important advances exist, and where World Bank knowledge, experience and resources can add value to country efforts. Our recommendations for country action are structured by sector, including: (a) health; (b) agriculture; and (c) water, sanitation and hygiene. Expanded coverage. By definition, UHC designs lead to greater breadth and depth in the population coverage of health services. This includes services like vaccination, preventative care and hygiene measures that lower the need for antimicrobials and thus slow the spread of AMR. Better oversight and quality of care. UHC models improve oversight in care practice. Among other benefits, this helps ensure that antimicrobial use conforms to rational standards. UHC strategies promote rational, regulated access to antimicrobials for all patients under the guidance of trained health professionals. Thus, UHC provides a framework for simultaneously expanding the well-regulated use of antimicrobials where they have been lacking, and tackling the overuse and misuse that have accelerated AMR in other settings. Smarter, fairer financing. The expansion of health systems towards UHC promises more efficient and equitable financing. This will help close existing access gaps for treatable infections. Pooled, prepayment financing also encourages rational purchasing and prescription, supporting the optimization of antimicrobial use and protecting the efficacy of current drugs. Improved stewardship and governance. A robust UHC approach builds systems governance and coordination capacities that are critical for the AMR fight. For example, improved antimicrobial stewardship can be built into accreditation processes for hospitals and clinics to bolster AMR control at the facility level. 2. Implementation of the International Health Regulations (IHR) can accelerate AMR action and focus global support. 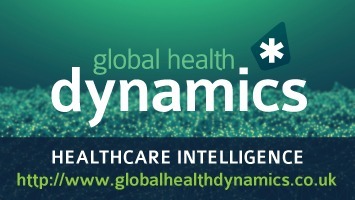 To meet their IHR implementation requirements, many countries are participating in systems diagnostic and planning exercises, for example, through the Joint External Evaluation (JEE) process, under the Global Health Security Agenda (GHSA). In order for these exercises to achieve full impact, each country must designate institutions and individuals who will be accountable for following up on evaluation results. Because each country’s implementation of IHR commitments benefits all other countries by improving detection and response to trans-border threats, the international community has an interest in adequately financing this global good. 3. Countries at all levels of income can build laboratory capacities for AMR surveillance – and create synergistic regional laboratory networks. Strengthening AMR surveillance capacities, including in low- and middle-income countries, is a cornerstone of AMR control. The creation of a national AMR surveillance network is becoming technically feasible and affordable for an increasing number of countries. Kenya, for example, is in the process of launching its own national AMR surveillance network at an estimated annual cost of about US$ 160,000, in addition to the ongoing costs of operating the country’s clinical laboratory network. Recent studies have shown how countries can benefit from early participation in regional laboratory networks (2, 7). The bulk of antimicrobial use in many countries occurs in the agriculture sector, particularly in livestock. The human health impacts of antimicrobial use in animal production continue to spark debate, and data are scarce. However, recent research suggests that AMR is already common in agricultural systems in low- and middle-income countries. 1. All countries can progressively reduce the use of antibiotics in animal production. Systematic reduction and eventual elimination of antibiotic use for livestock growth promotion is critical for long-term AMR control. This goal has drawn increasing consensus among scientific experts and many political leaders. European Union countries have banned the use of antimicrobials as growth promoters since 2006. Countries’ specific contexts must be taken into account in designing plans and establishing timelines. Countries that currently rely heavily on the use of antibiotic growth-promoters may require more time and support to adapt their production regimes. Some low-income countries may benefit from extensive technical support. Experts, including the UK Review on AMR (4), have recommended the use of national numerical targets to drive reductions in the use of antibiotics in agriculture. We support this approach. The use of time-bound, quantitative targets can be a powerful motivator. Solutions for the livestock sector should foster the adaptability of animal production systems to reduced use of antimicrobials. We can protect farmers as antimicrobial practices change. Small farmers may be especially vulnerable as changes to established production methods are introduced. Governments and development partners have a fundamental responsibility to accompany small farmers in adapting their modes of animal production. Policy action must also take account of global disparities in access to antimicrobials for livestock, mirroring those in human health. 2. New partnerships can spur innovation against AMR across agriculture, the environmental sciences and health. There is a need to inform and incentivize the global innovation agenda to target the most strategic points for new AMR-management technologies. This would include not only new antibiotics, but also new vaccines (both animal and human), the rapid-diagnostics agenda, and policy innovation in areas like compensation or insurance mechanisms for farmers who cut antibiotic use. How might this be done? We can point to promising precedents: innovative models of collaboration that have proven effective for other complex, multisectoral challenges. One example is CGIAR, a global consortium of agricultural research centres supported by an extensive network of partners, including the World Bank. For some 50 years, CGIAR has generated creative and practice-relevant research on food security, rural poverty reduction, and sustainable resource management. Today, to jump-start new investment in AMR research and technological innovation, we can learn from CGIAR and other network models for knowledge production. Historically, safe drinking water and sanitation facilities, along with basic hygiene practices such as handwashing with soap and water, were decisive in reducing the spread of infections, even before modern antimicrobials were invented. In the AMR age, such infection-prevention strategies once again become salient. 1. Countries can harness the power of water and sanitation investments to check infections, fight AMR, and support economic growth. Expanding access to sanitation and clean water is among the most powerful AMR-sensitive investments available. As leaders weigh development investment options, it is important to reckon public health benefits, including AMR containment, in the expected benefits from funding water and sanitation. 2. Hygiene in health facilities: Simple tools, strong impacts. The settings where water, sanitation, and hygiene practices can combine to powerfully impact AMR include health facilities. Basic hand hygiene (handwashing with soap and water or alcohol-based products) has repeatedly been cited as the single most important practice to reduce healthcare-associated infections. Improved hand hygiene has been associated with a sustained decrease in the incidence of AMR infections in healthcare settings. Today, in countries at all income levels, these basic tools are not being rigorously applied. While this is alarming, it also represents an opportunity for low-cost, high-yield action against AMR (8). What will the World Bank Group do? The agenda for AMR action implies responsibilities for the World Bank Group. Our recent report spells out planned actions in detail (2). Here, we highlight selected areas where World Bank Group know-how and resources will add value to country efforts and global initiatives on AMR. The World Bank Group will work with countries and partners to develop an investment framework to deliver the objectives of the AMR Global Action Plan. The framework will include rigorous costing of priority AMR interventions at country, regional, and global levels. Costed plans for AMR will be integrated with broader country agendas for emergency preparedness, response and resilience, which are gaining momentum through the WHO Monitoring and Evaluation Framework, the OIE Performance of Veterinary Services (PVS) pathway, and other mechanisms. and funding into finance mechanisms that will be sustainable over time. The framework will be a decision tool for policy-makers, planners, development finance institutions, donors, and other partners in the AMR effort, helping ensure that AMR finance flows to where it is most needed and achieves the greatest impact. The World Bank Group will review its own investment lending policies and instruments to support the AMR agenda across relevant sectors. As the Bank Group weighs investment options in dialogue with country leaders and partners, we will apply an AMR lens to identify those projects that hold promise for AMR-sensitive impacts. Over time, the systematic inclusion of an AMR perspective in investment conversations may evolve towards the creation of a formal screening instrument similar to the World Bank’s mandatory Climate and Disaster Risk Screening tools. The private sector can contribute substantially to tackling AMR, and private sector capacities and creativity in this area are only just beginning to be tapped. The International Finance Corporation (IFC) is the arm of the Bank Group that invests in and advises private sector companies. For example, IFC is active in the animal protein sector through investment and advisory work. In engagement with its clients in animal production, IFC reviews operational practices and provides benchmarking for clients on good industry practices, including the use of veterinary services and antibiotics. Where government regulations evolve towards a more focused use of antibiotics in livestock, IFC will partner with private producers and their associations to support the sector’s transition through management practices and investment. Many countries are currently carrying forward ambitious UHC reforms with World Bank support, and more are poised to adopt UHC goals. Countries’ commitment to implement UHC provides multiple opportunities to reinforce AMR containment. The World Bank will work through its policy dialogue and technical collaboration around UHC to support countries in leveraging health system reforms to accelerate progress on AMR. Currently, the World Bank is financing improvements in core public health functions in multiple countries, notably for disease surveillance and laboratory strengthening. These investments reflect a broad consensus on the need to strengthen global health security and reinforce preparedness. AMR is part of a wider spectrum of infectious threats that generate outbreaks with epidemic and pandemic potential. Thus, the AMR and health emergency preparedness agendas are intertwined. The consolidation of core human and animal public health capacities; the creation of health systems resilient to emergencies; and the AMR fight reflect largely convergent and mutually-reinforcing agendas. The World Bank will expand its action to help countries capitalize on these synergies. Many important aspects of the AMR threat lie beyond the scope of our discussion here and of the World Bank Group report on which this article is based. Yet we hope our work can clarify implications of AMR that have been insufficiently understood, and help point the way towards viable solutions. Those who will benefit most do not have a voice. Many of them have not yet been born. AMR is a threat to our economic future, but above all to the future of our children. Bold action today can safeguard the health and prosperity of those who will come after us. Dr Enis Barıs is a medical doctor with degrees in Public Health (MSc) and Epidemiology (PhD) and experience as Director, Manager and Technical Expert in over 30 countries. Dr Barıs is currently the Practice Manager in the Health, Nutrition and Population Global Practice for the Europe and Central Asia Region at the World Bank. Previously, he was the Practice Manager for the Middle East & North Africa and the Caribbean Regions. He also worked for WHO as the Director of the Division of Country Health Systems, and for the International Development Research Centre of Canada as Chief Scientist and Senior Scientific Advisor. Alexander Irwin is an independent public health policy consultant and an MD candidate at Weill Cornell Medical College, New York City. Recent contributions include as lead writer on Taking on Inequality: Key Findings, the companion advocacy report to the World Bank Group’s Poverty and Inequality Report 2016. Alessia Thiebaud is a Research Analyst in the Health, Nutrition and Population Global Practice for the Europe and Central Asia Region at the World Bank. Previously, she worked in the Poverty and Equity Global Practice for the sub-Saharan Africa and South Asia Regions at the World Bank. Dr Timothy G Evans is the Senior Director of Health, Nutrition and Population at the World Bank. Previously, he was Dean of the School of Public Health at BRAC University in Bangladesh. From 2003 to 2010, he was Assistant Director General at WHO. Dr Evans has been at the forefront of advancing global health equity and strengthening health systems delivery for more than 20 years. He has been a co-founder of many partnerships, including the Global Alliance on Vaccines and Immunization (GAVI). He received his Medical Degree from McMaster University and earned a DPhil. in Agricultural Economics from the University of Oxford. 1. Hardin, G. 1968. “The tragedy of the commons.” Science 162 (3859): 1243–1248. 2. World Bank. 2017. Drug-Resistant Infections: A Threat to Our Economic Future. Washington, DC: World Bank. 3. WHO (World Health Organization). 2015. Global Action Plan on Antimicrobial Resistance. Geneva: WHO. 4. Review on Antimicrobial Resistance. 2016. 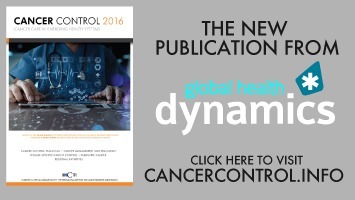 Tackling Drug-Resistant Infections Globally: Final Report and Recommendations. London: Wellcome Trust and Government of the United Kingdom. 5. FAO (United Nations Food and Agriculture Organization). 2016. The FAO Action Plan on Antimicrobial Resistance 2016-2020. Rome: FAO. 6. OIE (World Animal Health Organisation). 2016. The OIE Strategy on Antimicrobial Resistance and the Prudent Use of Antimicrobials. Paris: OIE. 7. CDDEP (Center for Disease Dynamics, Economics & Policy). 2016. East Africa Public Health Laboratory Networking Project: Strengthening the Role of Laboratories in Tracking Antimicrobial Drug Resistance in East Africa. CDDEP.